Stand with your feet wide apart, facing the long edge of your mat. Keep your back foot parallel to the short edge of the mat, or turned in slightly. Pivot on your front heel so that your front toes point toward the front short edge of the mat. Traditionally, the heel of the front foot is aligned with the arch of the back foot in warrior II, but you can also walk your left foot a little more to the left for a wider stance and greater stability. Start by bringing your hands to your hips. Bend your front knee so that it stacks over your front heel (generally speaking, your knee moving past your ankle is an indicator to widen your stance), and keep it pointing straight ahead (moving your knee toward the pinky-toe side of your foot, while keeping the ball of your big toe grounded on the floor). Draw the left side of your belly toward the right side of your belly so that your torso faces the right long edge of your mat, but don’t worry about “squaring” your hips with the long edge of the mat (it almost certainly won’t happen). If you turn your torso so much that your front knee drops in, you’ve gone too far. Align your shoulders directly above your hips. Roll your back inner thigh up, and keep your back leg straight and strong as you stretch your legs apart from each other. Float your arms out to your sides. At first, you might bring your hands just slightly higher than and forward of your shoulders so that you can easily settle the heads of your arm bones back into the shoulder sockets. Retaining that, bring your arms to a “T,” level with your shoulders. Turn your head only as far as is comfortable for your neck. 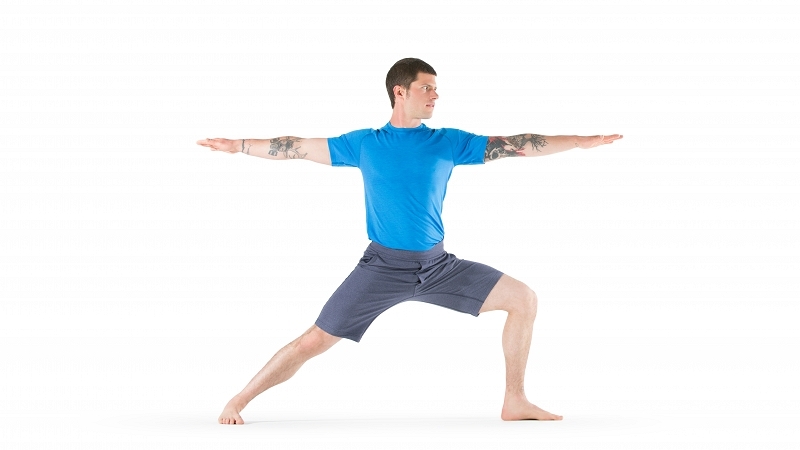 Practice with the outer edge of your back foot against a wall for more support.